A 100 year old former lifeboat will be part of a Scottish coast to coast fundraiser in aid of the RNLI and other charities next week (10 –12 August). Yorkshire drinking buddies and fundraising enthusiasts, The Ales Angels, will row across the 60 mile long Caledonian Canal to Inverness with help from volunteer RNLI crew members from Mallaig, Loch Ness and Kessock at different stages. The Angels’ hope to raise upwards of £5,000 and supporting them through the three days will be a group of 15 cyclists from Whitby Rugby Club, which is the home of the recently restored historical lifeboat the William Riley. The Caledonain Canal is part of the Great Glen and to help the team raise money for the RNLI, local people are invited to take up the Great Glen Ways 'Boot, Bike and Boat' challenge by running, walking or cycling the route. Contact Graham Chaddock on 07710 378 434 for more information. The six Ales Angels have a history of entering ambitious boating fundraisers and raised £20,000 in 2007 by pedalo-ing the length of Loch Ness – 30 miles. This is the first time that they have rowed the William Riley in Scotland and one of the event organisers, Peter Thomson, explained that fundraisers for the RNLI like this are the exact reason that the William Riley was restored. In 2008 they rowed the historic lifeboat from Tynemouth down to Whitby raising money for the different lifeboat stations on the way and like this year in Scotland, they were joined on the row by different crew members from each of the three Scottish stations. ‘We are very grateful for The Whitby Historic Lifeboat Trust offering to bring the William Riley to Scotland to raise funds for the Mallaig, Kessock and Loch Ness RNLI lifeboat stations. This should be a great fun team challenge involving not only volunteer lifeboat crew but RNLI staff from the Scottish divisional base in Perth also.’ The Caledonain Canal is part of the Great Glen and to help the team raise money for the RNLI, local people were invited to take up the Great Glen Ways 'Boot, Bike and Boat' challenge by running, walking or cycling the route. Sunday Aug 9th 5P.M. 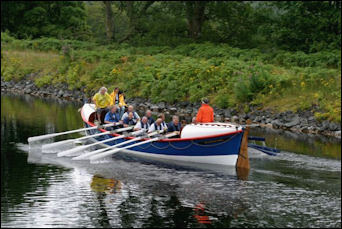 Launch boat at Corpach Boat Builders 1 mile North of Fort William. Row to the sea lock and moor boat. Sunday Aug 9th 8.30P.M. Fundraising event at Fort William Rugby Club, Mallaig Road at start of Caledonian Canal. Monday Aug 10th 8A.M. Enter sea lock and ascend Neptune’s Staircase. Monday Aug 10th 12 Noon Gairlochy Swing Bridge to enter Loch Lochy. 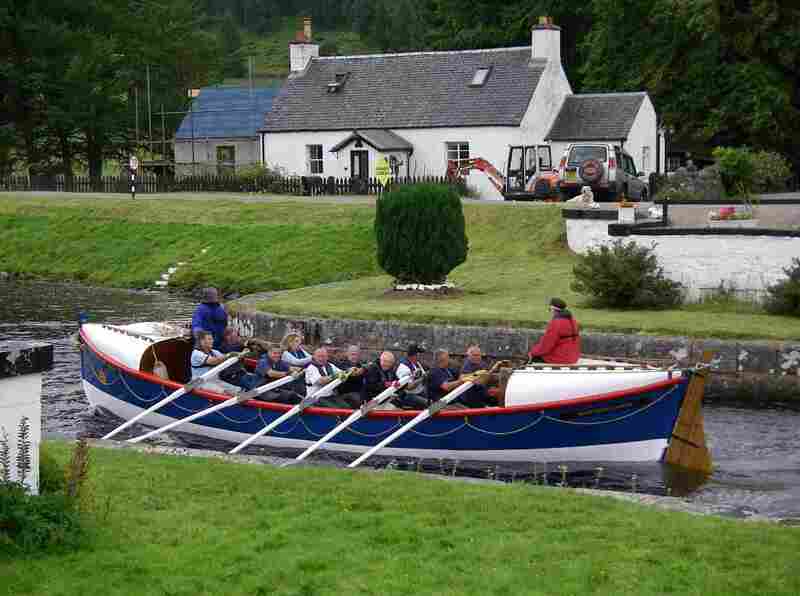 Tuesday Aug 11th 8.30AM Row Loch Oich and Caledonian Canal to Fort Augustus. Tuesday Aug 11th 12 Noon Through locks and out onto Loch Ness. Tuesday Aug 11th 3.30P.M. Moor up Urqhuart. Tuesday Aug 11th 7P.M Drinks and Fundraising in Drumnadrochit. Wednesday Aug 12th 10A.M. Leave Urquhart Bay, Drumnadrochit and row rest of Loch Ness and Caledonian Canal to Caley Marina Inverness. Wednesday Aug 12th 2.30P.M. Boat out of the water. Job done! The William Riley lifeboat of Birmingham & Leamington was built in 1909 by Thames Ironworks and began her RNLI service at Upgang Lifeboat Station in June of the same year. She was transferred to Whitby as No.2 boat in November 1919, launched 31 times and saved 10 lives. The William Riley was decommissioned in May 1931 and sold several times before being donated to Whitby by Dave Charlton. In 2006-7 a group of volunteers began a major restoration operation with generous help and donations from suppliers and skilled craftsmen. In May 2008 the boat received her seaworthy certificate and now is available to RNLI branches as well as schools and other groups to be used for fundraising and education events. The William Riley is now owned by the Whitby Historic Lifeboat Trust. For more information please contact Graham Chaddock on 07710 378 434 or Rachel Martin, Media Relations Manager Scotland on 07786 668903 or ramartin@rnli.org.uk or contact RNLI Public Relations on 01202 336789.